I want to thank you both again for the wonderful care you provided for my profoundly disabled son Reese. Believe me, I know how difficult any type of medical consult, exam or procedure can be when faced with these types of challenges. Your kindness, compassion and professionalism are unparalleled. The anesthesiologist and staff were terrific too! The mouth feels great. I just wanted to drop off a line to except how grateful and satisfied I feel with you and your whole team. Everyone is so super caring, friendly and mostly very professional. The way you guys handled my phobia was beyond my expectations. So thank you & and so happy to finally got back into dental care. Please pass on my thank you also to the rest of the team. My wife and I were referred to Dr. David Kurtzman ten years ago by a trusted friend, and we have been raving fans of his ever since. 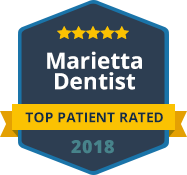 He and his wonderful staff run a patient-focused, painless dental practice that I routinely recommend to friends in Atlanta and north Georgia. In addition to being the best dentist I've ever had, 'D.K.' is also a warm, friendly, inspirational person who genuinely cares about his patients' health. I do not know anyone without some fears. In cases like mine, [fears of dental work] are based on actual incidents which occurred both in my child hood and as a young adult and have developed into a phobia. My experience with Dr. Kurtzman and his staff has been outstanding. Everything from the office environment to the extra time spent explaining details of given procedures prior to doing anything was very assuring. Every phase (of the hospital treatment) including recovery happened just the way it was explained. My first visit to [Dr. Kurtzman's] office was extraordinary. Although most of the procedures could have been performed in Dr. Kurtzman's office, I decided to have all the dental work performed in the hospital operating room under general anesthesia due to my apprehension and dread of dental work. It took approximately eight (8) hours to complete all of the procedures. After a short stay in recovery, I was transferred to a room for observation. Dr. Kurtzman left orders providing ample pain relief so I spent a relatively quiet and pain free night. The subsequent visits to Dr. Kurtzman to have my crowns seated were pain free and enjoyable. Dr. Kurtzman and his staff were truly an answer to my prayers. My experience with Dr. Kurtzman, staff and Windy Hill Hospital was outstanding - everything I expected and more! Dr. Kurtzman goes the extra mile to make his patients comfortable and as pain free as possible. I think I look better, I know I feel better! I would definitely do it (treatment in the hospital under general anesthesia) again if needed. Even if I have a dental issue, I still leave feeling good because I know I am in the best hands possible. It was the best experience I've had at the dentist in my whole life... no exaggeration. Thank you!!!!! I like the friendliness of the staff and Dr. Kurtzman the most. Since you HAVE to go to the dentist, Dr. Kurtzman & his staff are the ones to see. I've been a patient for many years and will be terribly upset when (and if) they retire. He and the staff are always patient forward, cutting edge and very empathetic. I would recommend this office to anyone (but you should have a sense of humor; if not, you will have one when you leave!). I really like the small size and the personal attention. It is helpful to me to deal with the general stress of dental care. Superb professional skill plus never in a hurry to get you out the door. I have not been to a dentist in 12 years from fear. I heard about Dr. Kurtzman and thought I would try him, so I called the office and made an appt. for a consult. Dr. K. and I sat and talked and I felt like I had known him for years and that he was a long time friend. I was totally relaxed. I felt an instant trust with this very educated, genuinely sincere, honest, caring, trustworthy dentist. I made an appt. that day for work to be done. I have been 5 times in 2 months getting well overdue dental work done due to my fear and anxiety of a dentist from bad experiences. I have a few more appts. left and then I will be done with the bad stuff. And then I will go on routine visits for cleanings etc. I will NEVER let my teeth get in the shape they were in before Dr. K. started fixing them. I hope and pray Dr. K. continues helping people such as myself. I would have lost all of my teeth if I had not found this amazing dentist. He will be my dentist as long as I need a dentist. Thank you to Dr. K. for an awesome experience. You and your staff are GREAT !!! This was the best dental experience I have ever had. Will recommend all my friends and family to this office! When I called to make my first appointment, Dr. Kurtzman answered the phone and spoke to me himself. He made a great impression before I even walked in the door! I think the staff is very personable and professional. They took the time to listen to my personal health history. The office has a great atmosphere and the hygenist was gentle and did a fantastic job! Ever wonder where really outstanding dentists go for their own personal dental care? THIS IS THE PLACE!!! I look forward to every visit because each member of the staff is an interesting, fun person with an exciting life outside of the office. Lots of laughter in every visit. Keep it up--it helps set you above the rest!!! Like always wonderful experience getting my teeth cleaned by Christy. As a person who used to be so anxious going to the dentist as well as a few days prior ...I no longer get that feeling or anxiety now that I go to Dr. Kurtzman's office. The staff is WONDERFUL!! Highly recommend this office to all people.. not just those with dental fears. Dr. Kurtzman does great work and that is reason alone to visit him. But, the fact that he and his staff run the practice like a close knit family of which his patients are a part makes it even better. Our drive to the practice is quite a distance, but we would never consider changing practices! The people are your strengths -- Dr Kurtzmann, the hygenist, the front office. It is a very well run office. I love you guys and refer any of my friends who happen to be looking for a new dentist office. Probably the best dentist visit I've ever had! I actually left feeling good! I like that the hygenist had plenty of time to spend with me. It helped a lot to hold the mirror and watch when she was working on my front teeth, which I'm most nervous about. I even let her floss them (around my bridge) Thank you!! I like the quality care and personal attention. I feel like I've maintained a friendship with Dr K and developed one with Kristi so I don't feel like "just a patient." And the conversations I overhear with others seem very similar so it's a "personalized care" experience. I feel that the care is excellent and that you all keep up with current practices. I admire the work that you do with special needs patients. Staff are always friendly - visits are like visiting friends and family (the good ones). Dr. Kurtzman and his team are prompt, efficient, and have exceptional customer service. Kristi is detailed when it comes to cleaning my teeth, giving suggestions for improvements, and super prompt when it comes to turning paperwork around that is needed. Plus she makes you laugh so much you come out with clean teeth and a smile on you face! There is always a warm friendly feeling upon entering your office. Thanks to you and your staff I no longer dread my dentist appointment. I also know that my teeth and gums are getting excellent care. Thanks for being so caring. This is the absolute best dental office I have ever been to. It's a great place to go for someone who has a dental phobia. Everyone there is very understanding of dental fears and very informative. The staff is very outgoing and friendly. I like the one-to-one care, knowing that I will be treated during my appointment instead of the doctor being interrupted to go to another patient. As always, more than satisfied. Treated with utmost respect and care, great service and of course, the best dental care! You guys make going to the dentist an enjoyable experience. I never thought I would say that! Dr.Kurtzman and his staff take the necessary measures to make your office experience a comfortable one. I have never been cared for by a doctor or professional staff in this manner; and regret that I didn't find them before now. The best way to describe them...Awesome!! Absolutely wonderful experience with great, friendly and funny people! I love going to the dentist now. Thank you for taking me on as a patient. I have unusual issues and I am not the 80% that can go to a conventional dentist. You are the FIRST dentist that understands my problem. You're the only dentist that has given me different options. Together, we've come up with a solution that has eased all of my anxieties. thank you, Thank You, THANK YOU! Dr. Kutzman and his hygienist were friendly, professional and skillful. I am pleased with the results of their work. I liiked the warm reception when I arrived and the fact that Dr. Kurtzman actually listened to my concerns. Your staff is outstanding! Everyone there loves their job and is happy to take care of you. Can't say enough good things about the office. This is Carrie Roberts . The one who was about to give birth:). All of my teeth feel great now. No hot or cold sensitivity. I am so happy. Everything was great and everyone was so nice. I will be sending my husband in soon. Thank you. Excellent, as always. The very best dentist and staff. They almost make me want to go to the dentist. yes on behalf of myself & my husband we feel....... very fortunate that our previous dentist was kind enough to have directed us........ to David Kurtzman and his staff and for that were are blessed indeed. Most people do not look forward to seeing their dental team, - I always do!, love these guys, David, Tonya and Kristi make it a most pleasant experience! They genuinely love what they do,-- constantly educate theirselves to be able to provide the most up to date services and products -- and KNOW their patients needs, temperments and threshold - making it a painless pleasant experience. Friendly, caring, professional, knowledgeable . . . an A+ experience. Dr. Kurtzman and his team members are always a pleasure to visit, regardless of the dental treatment I need. Thank you everyone! For me the quality of care is most important. Next to that I really appreciate the staff and their honest communication of what I need to do or have done. I've been a patient for 20+ years. Everyone is extremely compassionate and kind and they work really well together as a team. You feel like you are hanging out with friends instead of getting your teeth worked on. They always work to hard to talk to me about all kinds of things during my very lengthy appts. to keep my mind off of my anxiety and they all esp. DR. DK are very good for my self esteem! You guys are the best. The care, friendliness and genuine concern you show for your patients is hard to find in other places. Dont' stop being who you are. Feel very confident that all my issues with my mouth are in great hands.Trust Dk with all his decisions on my dental care. AS long as you've been in business, I've always had great sevice.I rue the day when I hear you are retiring, so don't!! I like everything! Don't change! No waiting around, explained proceedures, friendly, and above all enjoyable staff. Efficient, pleasant, understanding, i.e. excellent. I would recommend to anyone. I love your staff, they are so sweet and you, Dr. K, are so understanding to my fears, and you all have helped save my teeth! I love the fact that Dr. Kurtzman answer the phone himself. I also like the fact that he remember me and comes out to the waiting area to talk. In addition I like the open feel of the office, as I am scared of dentists and it seems less threatening that way. The warm, open atmosphere in the office makes a dental appointment like a visit to old friends. We'll take the same special care of you regarding any of your dental needs. Please call or contact Dr. Kurtzman's office to schedule your appointment today.